It’s always fun to look at examples of successful campaigns and to learn from great persuaders. 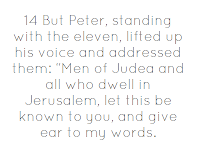 With Easter behind us a few days I thought we could look at one of the most successful speeches of all time: Peter’s address at Pentecost. He transformed the lives of thousands of people with one speech, amid extremely adverse conditions. Let’s take a look at how it happened. First, a little background on the environment where this event took place. After Jesus was crucified, he rose and appeared to hundreds of people over at least a few weeks time. But the large majority of the population thought of Jesus as simply a wise teacher and a failed Messiah. They were probably aware of rumors of his ressurection but there was no real support of Christ as savior and there was certainly no ‘Christianity’ as a religion. In fact, Jesus himself instructed his followers to await the Holy Spirit before setting out to evangelize. During the Feast of Weeks, Jews from dozens of countries gathered in Jerusalem to celebrate the harvest. It was during this time that the apostles received the Holy Spirit and began speaking in tongues to the crowds. The audience was amazed that they were hear the message in their own language. But rather than embracing this phenomenon as proof of the Lord’s involvement, they were confused and skeptical. Some were openly adverse to what was happening, heckling the speakers and accusing them of being drunk. It was in this environment that Peter delivered his presentation. Entering a chaotic situation, Peter took charge by quickly connecting to the audience, establishing an authority and by challenging them with an extremely confrontational style. By laying into his audience he ultimately won them over. Rather than laying out a logical path for them to follow or presenting facts and letting the audience draw their own conclusions, Peter hits them over the head with their failure. The most difficult part of creating change is pushing through simple agreement, where the audience is smiling and nodding in their seats, but won’t wind up actually doing anything. Peter pulled it off by essentially calling his audience out. ‘The miracles and wonders that surrounded Jesus’s ministry should have made it plain that he was sent by God. But instead of receiving that gift, you put him to death.’ That kind of accusation would make indifference impossible. The result of Peter’s arguments were just what he needed to create change. The audience recognized the problem and were ashamed enough to be open to a new direction. The last thing he had to do was to offer a tangible action that they could take right then. This part is not as tough as all the convincing, but it’s critical to sealing the deal. 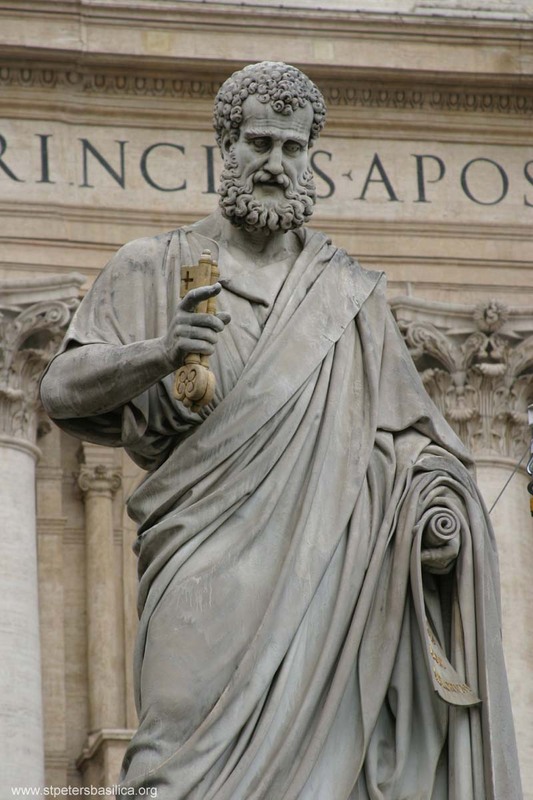 Peter is ready when they ask ‘what must we do?’ He tells them simply ‘repent and be baptized’ and ‘receive the Holy Spirit.’ He also offers the help and support they need to take that action. With such a simple way to get started, the audience responds in a big way. 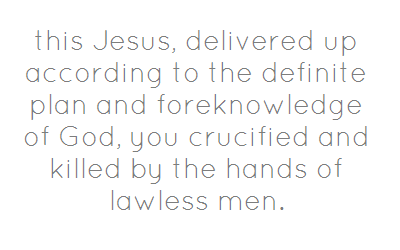 Acts 2:37 says when they heard this, they were cut to the heart. I love that line. According to Luke’s account, over 3,000 men went from being confused skeptics that doubted Jesus’s ministry to committed believers willing to stick their necks out in front of their families and culture to follow Christ. It’s an amazing turnaround. The other part of that process that I’ve left out, but that can’t be overstated, is the work of the Holy Spirit in working on hearts. No doubt Peter’s words alone would not have had the same effect. 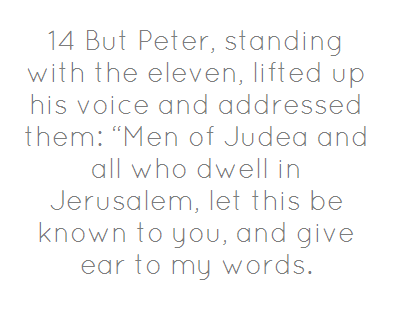 Being obedient to the Spirit’s leading, Peter was used in a dramatic way on Pentecost and provided a great blueprint for using persuasive rhetoric in a positive way: connect with the audience, establish why they should listen, make action urgent and have a simple way to get started.